Objective: Research in the dental field is progressing at mightier speed worldwide, but an unfortunately representation of India at this platform is negligible. The present study was undertaken to unearth the barriers for dental research among dental professionals in Indian scenario. 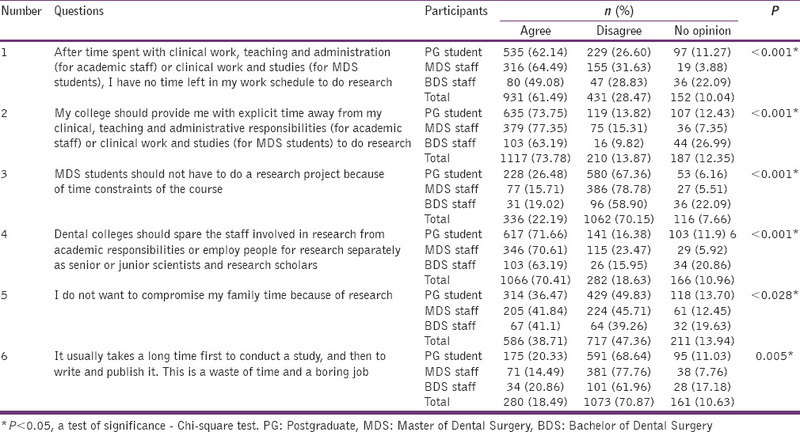 Materials and Methods: A cross-sectional questionnaire study was conducted on 1514 participant's (Master of Dental Surgery and Bachelor of Dental Surgery staff) and postgraduates in 40 dental colleges of India selected by multistage random sampling. The response rate was 75.7%. The survey was undertaken from July 2013 to December 2013. The survey instrument was 24-item, investigator developed, self-structured, close-ended, and self-administered questionnaire grouped into four categories that are, institutional/departmental support related barriers, financial/training support related barriers, time-related barriers, and general barriers. Results: Among all respondents 47.23% informed that they are administrative and educational work rather than research work as (P < 0.001). Overall 57.53% of study participants reported lack of administrative and technical support for research work as (P < 0.001). Overall 64.9% reported meager college funding was the barrier (P < 0.001). Overall 61.5% respondents reported lack of time to do research work due to clinical and teaching responsibilities (P < 0.001) was the barrier for research. Largely 80.25% agreed that, the lack of documentation and record maintenance are an obvious barrier for research (P < 0.001). Conclusions: Present study unearths certain barriers for research in an Indian scenario, which includes administrative overburden, lack of funds, and lack of documentation of the dental data. Governing authorities of dentistry in India have to make major interventions to make research non-intensive environment to research-friendly environment. Research in the dental field is progressing at mightier speed worldwide. Recent times have witnessed a tremendous improvement in dentistry due to the development of newer technologies, improved and sophisticated dental paraphernalia, dental materials, drugs used in dentistry, and urbane diagnostic materials for providing precision and speedy diagnosis of oral diseases. The situation of dental research in India is in the nascent stage even though we have more than 300 dental colleges, which are more than any number in the world, Moreover, opening of new dental colleges are on the rise in India. The total number of dental institutions in India is 305 and the number of students completing Bachelor of Dental Surgery (BDS) degree in 1 year is 23, 690 and Master of Dental Surgery (MDS) degree are around 4000. Dental staff in various dental colleges in India is around 12000. This constitutes a vast number of oral health care professionals, which can be utilized for the upliftment of dental research in the Indian setting. However, unfortunately, the representation of India toward dental research on the international stage is negligible. There are definitely some unexplored barriers for the growth of dental science and scientific publications in India. Unless these barriers are identified through a scientific survey across India, it will be difficult to rectify the system to create an ideal atmosphere for the growth of dental science and knowledge transfer from India to the world. Unfortunately, there is severe paucity of literature on the Indian platform exploring barriers for dental research as there are no studies reported till date; hence the present questionnaire-based study was conducted across India among postgraduate (PG) students and faculty of different dental specialties with the aim to identify barriers for initiating and conducting research by faculty members and PG students in Indian dental schools and to fill the literature gap. Information about perceptions and attitude, toward dental research among faculty members, and PG dental students was collected through a questionnaire, which might provide valuable information for policymakers, course regulators, and administrators for certain amendments. It might provide baseline information regarding existing barriers which can be thought provoking and can serve as a channel for discussion and reflection on how dental schools and Dental Council of India can build a favorable institutional culture and help those individuals who desire to serve this educational arm of dentistry and perform seamless research activities and get their work published. It might eventually help in paving the way for efficient research activities in India. The survey instrument was 24-item, investigator developed, self-structured, close-ended, and self-administered questionnaire. Permission to carry out the study was obtained from the college authorities, and ethical clearance was obtained from the Ethical Committee of Institutional Review Board of the Jodhpur Dental College General Hospital, Jodhpur, Rajasthan, India. Principals of selected dental colleges were contacted and were explained about the purpose of the study and also by use of cover letter attached with the packet containing questionnaire. Participation in the research was on a voluntary basis, and no incentives were used for the respondents. Participants who gave informed consent were included in the study. Occupational category information (MDS faculty, BDS faculty, and PG student) was obtained so that the significance of the responses, barriers pertaining to each occupational category can be understood and analyzed. A total sample of 2000 was targeted and based on that 2000 prints of questionnaire was taken out and distributed, out of which 1514 candidates from 40 dental colleges returned the questionnaire with a response rate of 75.7%. The barriers for initiating and conducting research by faculty and PG students in Indian dental schools were identified from 24 questions applicable to the Indian dental education, human resource and training, research and academic environment, institutional, infrastructure, resources, funding, time related issues, and other reasons. The attitude was assessed by means of five point Likert scale: Strongly agree, agree, no opinion, disagree, and strongly disagree. The questions were grouped in four categories that are, institutional/departmental support related barriers, financial and training support related barriers, time-related barriers, and other general barriers. The response for each question was based on selecting between no opinions, strongly agree, agree, disagree, and strongly disagree. Later during analysis, strongly agree and agree were combined into one response as percentage respondents agreeing. Similarly, disagree and strongly disagree were combined into one response as percentage respondents disagreeing. A pilot study was conducted to test the reliability of the questionnaire, by considering convenience sample of 50 from the faculty of Jodhpur Dental College General Hospital. The Cronbach's alpha value of the questionnaire was 0.72. The questions underwent subsequent revisions before the main study for the understanding of subjects. The revisions were related to clarity of five questions for attitude. The results of the pretested questionnaire on 50 faculty members were not included in the main study, only the reliability was assessed. The participants for the pretested questionnaire did not take part in the main study. The data were entered into the MS Excel (MS Office version 2007 developed by Microsoft, Redmond, WA, USA) and Intercooled STATA version 9.2 (StataCorp, TX, USA) were employed to perform statistical analysis. The level of significance was set at 5%. The results were expressed as frequency and percentage. The data were subjected to Chi-square test to check the significance of the difference between different occupational categories. [Table 1] revealed that 60.24% respondents agreed that their college libraries had enough references to support the research. About 56.47% of respondents believed that they have the good interdepartmental co-ordination to do research. About 47.23% of respondents informed that they are mainly into administrative and educational work rather than research work. About 70.41% of participants get encouragement and motivation to pursue research from my guide/superiors. According to 57.53% of study participants, their college/university does not provide exclusive administrative and technical support for research work. Overall 30% reported that their research work or publications suffer due to departmental or interdepartmental politics regarding authorship issues. All the responses with the occupational categories were significant as (P ≤ 0.05). The [Table 2] revealed that a huge majority of respondents, that is, 64.9% said that meager college funding and 58.6% agreed that poor promotional incentives by their universities were the prime reason why they could not do a research work. About 53.76% blamed their college for poor training for applying for grants, 43.4% blamed their college for poor training for statistical, and analytical skills. About 15.1% thought that poor training in English language/grammar was caused of rejection of publication in international journals. All the responses with the occupational categories were significant (P ≤ 0.05). The questions related to time-related barriers revealed that while 61.5% respondents thought that they did not have enough time to do research work after clinical and teaching responsibilities, 73.8% respondents wanted that their universities to provide them explicit time to do research work separate from other college responsibilities. About 70.4% respondents believed that due to time constraints, colleges should have employed a separate research team/duties. About 38.71% of participants did not want to compromise their family time because of research and 18.5% thought that research and publication was a waste of time and boring job. All the responses with the occupational categories were significant (P ≤ 0.05) [Table 3]. Other general barriers revealed that 33.2% respondents thought that the quality of my scientific work and research was good, but it is not accepted in International Journals because the editor and editorial board are unfair to Indian authors. About 80.25% agreed that, the lack of documentation and record maintenance are an obvious hurdle to research work in India. All the responses with the occupational categories were significant (P ≤ 0.05) [Table 4]. India the largest manufacturer of dental graduates has the least representation at the world dental research platform. This scenario has highlighted the inadequacies of the dental research environment in India. This study was a part of the efforts to explore various issues related to barriers to dental research in dental institutions in India. This is the first attempt that investigates perceived barriers for dental research among faculty members (MDS and BDS) and PG students in India. This might significantly change the culture of dental school training into a supportive environment for research/scholarship, thereby increasing academic productivity. For the growth of science, it is not only important to do research but it's equally important to publish the findings in the national and international journals for knowledge distribution worldwide. As per the regulations of Dental Council of India, all PG students have to do mandatory scientific dissertation as a statutory requirement for completion of their degrees. In addition, there are numerous short scientific studies done routinely by undergraduate students and PG students under the guidance of faculty. These PG students do scientific research, but hardly very few students get success to get their work published. It is also important to mention those dental faculties who either supervise graduate or PG students themselves perform research and often fail to get their work published. Our study revealed several reasons for this non-research and publication oriented environment in dental schools in India. Another important barrier is a lack of exclusive administrative and technical support for research work. The results obtained in our study are similar to the study reported by Haden et al. In most of the dental institutions in India, there is no provision of recruitment of staff that can render technical assistance in collection and analyzing data. Computer facilities for processing data are also lacking. Other than the training for writing grant applications successfully, it is also important to highlight that most the Indian researcher do not know as how many agencies are there which can provide grant and which agency will grant funds for what kind of study. Before one start a research work he/she has to evaluate critically the methodology and the results section of the research paper and try to adopt it in the platform they are working with. Many study participants reported that they were not competent enough to critically appraise the research paper, hence become a prominent barrier for quality research. Most of the work, which goes in the name of research, is methodologically erroneous. This could be attributed to the fact that Dental Council of India does not include research methodology in detail as a part of BDS curriculum. Students are exposed less to research projects during their BDS tenure and hence face problems during their masters. From commencement to completion of research projects and publishing the new discoveries, a researcher needs sabbaticals (paid leave for personal and professional development) as a relief from teaching and administrative duties. Davidson et al. reported that sabbaticals are mandatory for the personal and professional growth of the individual. Surprisingly, no such concepts exist in any of the dental institutions in India, neither private nor government. Even dental council of India has not provided any guidelines regarding sabbaticals. If the interested researcher has to go for research work, they have to use their casual leaves or with the loss of pay. This is a significant barrier for dental research in India. Another important barrier to mention is what the Indian authors think about the international editorial board. It is not that international advisory boards are unfair to Indian authors, but they expect a better quality of research and its reporting. The quality of scientific work and research in terms of methodology and clinical trials has to be up to the recent developments. This barrier has to be removed by in-depth training in research methodology, utilization of the available newer materials, equipment. Lack of documentation and record keeping is a major hurdle in Indian scenario. The same has been reported by Best and Kahn  This could be attributed to the fact that presently there are no research jobs in Indian dental schools and there is necessity that human resource department should have trained or certified dental research assistants/data analysts in the research team. This could be achieved by framing guidelines for research from the dental council of India and to train Indian dentists to keep records, to emphasize it by making it mandatory by law. The present study highlights certain barriers for research in Indian scenario which includes bureaucracy and administrative overburden, lack of adequate and timely secretarial, technical and computerial assistance, frustration from inter and intradepartmental politics, lack of funds and inexperience in grant writing and approval, lack of training in critically appraisal, non-availability of sabbaticals, no provision of jobs as research professionals and lack of documentation of the dental data in the dental institution. The study highlights the need for major interventions from the governing authorities of dentistry in India to make the research non-intensive environment to research-friendly environment. Authors would like to sincere thanks to all the Principals and participants in the study. The author would also like thanks to AjitAuluck, JocelyneFeine, Paul Allison - for their guidance in framing the questionnaire and poster preparation for presentation at International Association of Dental Research meet. Sivapathasundharam B. Research career in dentistry. Indian J Dent Res 2009;20:255. Dental Council of India, Government of India. Available from: http://www.dciindia.org/. [Last accessed on 2014 Jan 16]. Steiner DL, Norman GR, editors. Health Measurement Scales: A Practical Guide to their Development and Use. PDQ Statistics. Oxford: Oxford University Press; 1995. p. 15-26. Shigli K, Hebbal M, Nair KC. Teaching, research, and job satisfaction of prosthodontic faculty members in Indian academic dental institutions. J Dent Educ 2012;76:783-91. Herzberg MC, Griffith LG, Doyle MJ. Driving the future of dental research. J Dent Res 2006;85:486-7. Balaji SM. Dental research: Present to future. Indian J Dent Res 2013;24:651-2. Hescot P. FDI: From research representation to action. Indian J Dent Res 2013;24:525-6. Brodin P, Bennett I, Appleton J, Bonta Y, Feher E, Fiehn NE, et al. 3.2 Ensuring research productivity in the future faculty. Eur J Dent Educ 2002;6 Suppl 3:97-106. Haden NK, Andrieu SC, Chadwick DG, Chmar JE, Cole JR, George MC, et al. The dental education environment. J Dent Educ 2006;70:1265-70. Trotman CA, Haden NK, Hendricson W. Does the dental school work environment promote successful academic careers? J Dent Educ 2007;71:713-25. Bailit H, Weaver R, Haden K, Kotowicz W, Hovland E. Dental education summits: The challenges ahead. J Am Dent Assoc 2003;134:1109-13. Davidson OB, Eden D, Westman M, Cohen-Charash Y, Hammer LB, Kluger AN, et al. Sabbatical leave: Who gains and how much? J Appl Psychol 2010;95:953-64. Best JW, Kahn JV. Research in Education. 5 th ed. New Delhi: Sterling Publisher Pvt. Ltd.; 1982.